SAN JOSE, Calif. – October 5, 2017 – Advancements in artificial intelligence (AI) and related applications are making headlines. While many online retailers plan to embrace AI to enhance customer experience, a new report published by SLI Systems (SLI.NZ), a global leader and provider of e-commerce solutions and services, found many have concrete AI plans for the next 12 months, yet VR/AR, Voice-Activated Apps and Virtual Buying Assistants remain elusive. In its third quarterly 2017 E-commerce Performance Indicators and Confidence Report, which reflects survey findings from hundreds of mid-size retailers with a mix of business models, SLI Systems found expectations for increased online revenues steadily increasing YoY, and brick-and-mortar forecasts upbeat, but geographic expansion plans waning. In addition, the study found retailers eager to capture early 2017 holiday sales starting in October. The full report is available for download at http://sitesearch.sli-systems.com/DownloadEPICQ3-2017_EPICReport.html. 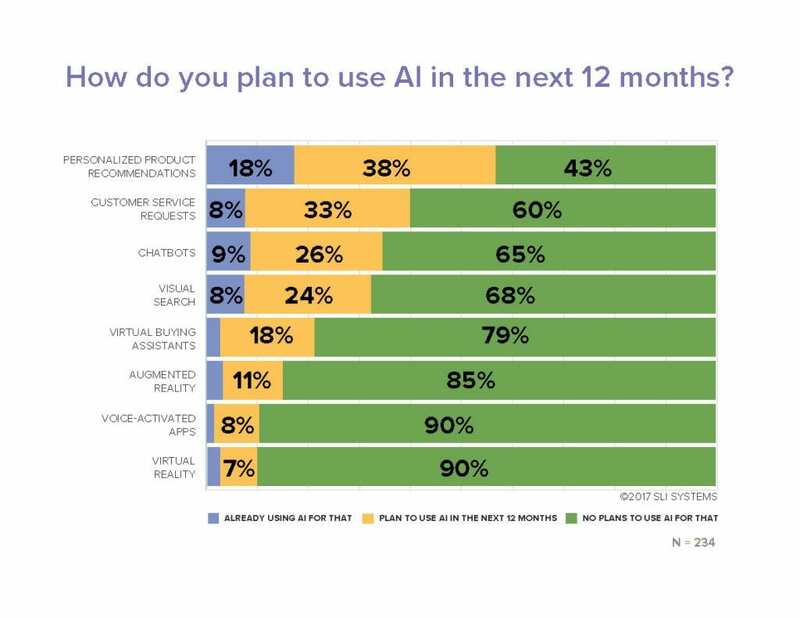 54% report their company uses or plans to add AI in the future, with the largest group of these respondents (20%) expecting to add AI within the next 12 months. Most popular applications for AI — ones retailers already use or plan to use within the next 12 months — are Personalized Product Recommendations (56%), Customer Service Requests (41%) and Chatbots (35%). Very few e-commerce professionals currently use AI for Virtual Reality, Voice-Activated Apps, Augmented Reality or Virtual Buying Assistants, or plan to in the next year. Steady Confidence – 92% of retailers surveyed are planning to grow in Q3, closely aligning with results from Q1 and Q2. Geographic Expansion Sinks – Selling to New Geographic Markets experienced the largest drop, moving to 20% in Q3 from a stable 30% in the first and second quarters. E-commerce Revenues – 87% expect their online revenues to increase in Q3 compared to Q3 2016. Mobile Grows / Segments Matter – 80% expect revenue from Mobile Sites and Apps to increase compared to the same quarter in 2016; 100% of those in the Hardware / Home Improvement segment, and 93% in Apparel, anticipate an increase. High Hopes for Brick-and-Mortar – With the Holiday season approaching, 45% estimate a rise in Q3 in-store Revenue / Profits compared to the same quarter last year – an improvement of 6 percentage points from Q2. “This quarter Replatforming edged out CX as the top priority for e-commerce. We’re seeing retailers working to ensure their platform and search strategies are in peak shape for driving Holiday site traffic and optimizing merchandising and conversion,” said Carter Perez, VP Sales, Americas and Australia, SLI Systems. Of the retailers surveyed who participate in holiday sales, nearly a third (31%) say the 2017 holiday shopping season will begin earlier in 2016, with 31% also citing October as the official start of the season. 77% expect an increase in holiday season revenue this year. Most forecast modest rises of up to 10%. Only 4% of anticipate aggressive increases over 30%. Q3 2017 EPIC Report results are from an electronic survey conducted between July 25 – August 23, 2017. SLI received qualified responses from 234 e-commerce professionals worldwide headquartered primarily in the U.S., Europe, Australia and New Zealand. All respondents sell goods or services online, with 57% selling in stores and 47% on Amazon. Eighty-two percent work in a manager position or above. Just under half reported their company’s total annual sales to be above $50 million (U.S.) with 15% generating above $500 million. Thirty-seven percent of respondent businesses sell 1,000 to 10,000 SKUs, with 25% selling 10,001 to 500,000. The next EPIC survey will take place in Q1 2018. E-commerce professionals who wish to participate may sign up at www.sli-systems.com/ecommerce-survey. SLI Systems (SLI.NZ) accelerates e-commerce for the world’s top retailers by generating more traffic, converting shoppers into buyers and maximizing order values through solutions that improve site search, navigation, mobile, merchandising, personalization, recommendations and SEO. SLI is the most chosen SaaS-based site search provider to Internet Retailer Top 1,000 retailers. The SLI Buyer Engine combines user behavior and artificial intelligence to accurately predict what shoppers are most likely to buy, shortening the path to purchase. The SLI Commerce Console™ organizes key sales insight and tuning capabilities into one easy-to-use cloud-based console. SLI operates on five continents and offers solutions in 20 languages. For more information, visit www.sli-systems.com or connect with us on Twitter @slisystems.